The newly installed Prime Minister of Armenia is amping up efforts to get a face-to-face meeting with President Donald Trump, an effort that recently received a boost in Congress, when nearly 50 members formally petitioned the White House to organize a meeting with the Armenia leader. 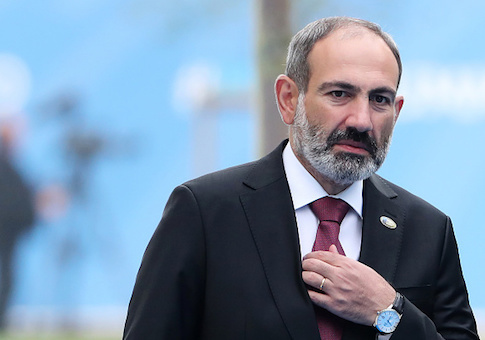 Nikol Pashinyan was swept into office in May after leading a poplar revolution against the former regime led by Prime Minister Serzh Sargsyan, who was forced out of office by Pashinyan, a prominent newspaper editor and reformist voice. On the heels of this electoral victory, Pashinyan has been seeking a one-on-one with Trump to help bolster ties between the United States and Armenia. The request for a meeting with Trump comes as tensions escalate between the United States and Turkey, which was recently hit with sanctions for its continued detainment of American Pastor Andrew Brunson. Proponents of the meeting with Pashinyan see an opportunity to bolster ties between the United States and Armenia as diplomatic tensions escalate with Turkey, which has traditionally had chilly relations with Armenia. "The Republic of Armenia has seen a remarkable change in its government through peaceful and democratic means over the past few months," wrote nearly 50 lawmakers from both sides of the aisle in a July 30 letter to the White House. "As part of this movement, Mr. Pashinyan—a former newspaper editor and political prisoner—led tens of thousands of Armenians through the streets of Yerevan to protest former President and Prime Minister Sargsyan's decade-long rule," the letter states. "Prior to being voted into his role of Prime Minister in May, Mr. Pashinyan organized this nonviolent grassroots movement known as the ‘Velvet Revolution,' which ultimately forced Mr. Sargsyan to resign." The United States has an opportunity to strengthen its ties with Armenia on the heels of a popular revolution that could usher in series reforms, the lawmakers said. "As Armenia seeks to bolster government transparency, strengthen democratic institutions, and empower civil society, it is critical for the United States to deepen its ties with this regional partner at every level of government," the lawmakers wrote. "Without question, your meeting with Prime Minister Pashinyan would help to further this goal and strengthen dialogue between our countries." As American pastor Brunson continues to be held in Turkish prison, the United States has an opportunity to cement ties with Armenia, one of Turkey's chief diplomatic rivals. In addition to a meeting with Trump, Congress is petitioning the U.S. administration to pursue high-level diplomatic talks with the new Armenian government. The lawmakers are seeking "a series of high-level conversations between your [Trump's] Cabinet Secretaries and their counterparts in Armenia—many of whom have recently been appointed as members of the newly formed government," according to the letter. "These meetings would help to establish a critical bridge between our countries, helping to further increase Armenia's inclusion in the international system and likely leading to more comprehensive U.S.-Armenian bilateral trade." The Trump administration has been mum on the request, declining to comment on questions from the Washington Free Beacon about a potential meeting. A State Department official told the Free Beacon it "reviews and appropriately responds to all congressional correspondence," but would not comment any further. The White House National Security Council also declined to comment on the matter. One former Trump administration official who has seen the letter told the Free Beacon the White House should seize the moment with Armenia and build up new ties. "At the very moment Turkey is turning away from the U.S. and our national interests abroad, Armenia is doing everything in its power to extend the olive branch and establish an even closer relationship with America," the source said. "President Trump should embrace that and not back down in the face of Erdogan and his radical Muslim thuggery." This entry was posted in National Security and tagged Trump Administration, Turkey. Bookmark the permalink.